Whether you’re a landlord with a home to rent or an agent advertising a new listing for sale, beware of free real estate listing sites. There are many reputable sites available for advertising your rental or listing, I’m not implying that all free sites are dangerous. Most sites do an excellent job screening and monitoring their listings for scams and can be helpful in reaching legitimate tenants and buyers. However, there are also sites that are notorious playgrounds for those who steal listing information and re-post it as their own. Most free sites require minimal information from those who post homes for rent or sale, making it easy for scammers to disappear after the scam is run. Here are a few common scams I’ve run across in my career as a real estate broker, leasing agent and property manager. Weekend Rental Hijack. Short term rentals can be fertile ground for scammers. My luxury condo listing across the street from a popular beach location was offered for long term lease, at least 12 months. One Saturday morning I received a phone call from a couple who had rented it for the weekend. They paid in advance by credit card after viewing the property online and were told a manager would meet them at the condo to provide the keys. When they arrived and saw my For Rent side out front, they called me. I informed them they had been scammed and recommended they report the incident to the police. Two weeks later I received a voice message from a police officer in the midwest. I returned the call using the police department’s main phone number to make sure I was not being scammed, too. The police officer was real and wanted my statement regarding the status of the property. Police in California had traced several fake advertisements to a person in the town where the officer was located and an arrest was going to be made later that day. Submitting An Application – Property and Landlord Unseen. This is one of the oldest and most common rental scams. The “owner” or “leasing agent” is out of the country temporarily, usually on a work assignment, but has someone local to show the property. However, they only show the property to qualified potential tenants and require that an application be submitted first. Rental applications are gold nuggets for scammers. They contain all the information needed to steal the applicant’s identity – name, address, social security number, date of birth, driver license number, employer – everything. As soon as the application is sent, the landlord’s email address is no longer valid and the identity of the applicant is stolen, followed by the usual personal and financial disasters that go along with identity theft. Just The Cash, Ma’am, Just The Cash. This scam is not as common as the others because it can be a little more complex. The scammer posts a copy-cat listing of a vacant property and finds a way to enter. They might pick the lock, break into the lockbox and make a copy of the key, or otherwise find a way to enter without leaving evidence. They make appointments to show the property when no one else is likely to be around. They take applications and approve a victim to move in, requesting a cashier’s check or money order for the first month’s rent and security deposit made payable to cash. They might even ask that initial rent and deposit be paid in actual cash – they will be happy to provide a receipt. Money in-hand, they are never seen again. What do these scams have in common? 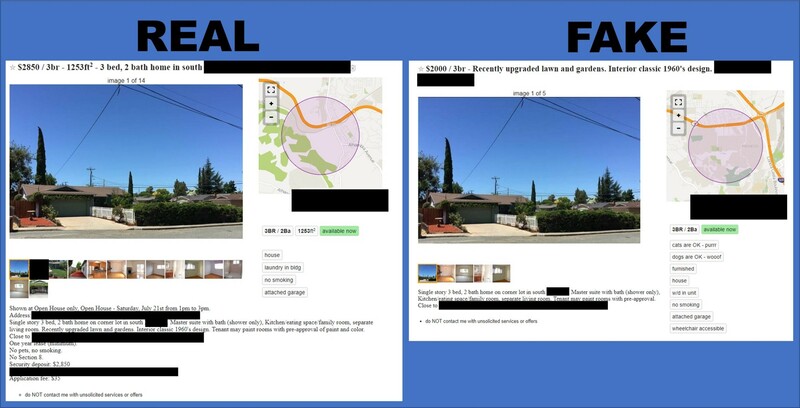 The scammer usually obtains property information from a legitimate listing, then re-posts a fake listing to draw in victims. Below is a recent listing I have for a rental property (click image to enlarge). My listing is on the left, the fake listing on the right appeared on the same free real estate listing site the day after I posted. The scammer lowered the price and copied just a few of my photos – just enough information to generate interest. I didn’t follow my own advice to beware of free real estate listing sites, but took my posting down immediately and reported the fake posting to site administrator. Unfortunately, this popular site is frequently used by potential renters. It is also well-known as a site where scam postings are common. Landlords and agents, if you do use free real estate advertising sites, monitor your postings regularly and check to see if duplicate postings have been made by scammers. It’s also a good idea to follow up on postings made on paid sites to protect your listings. Notify the site administrator as soon as you notice questionable information posted and inform the police if you believe criminal activity has taken place. Potential renters and home buyers – be careful, too! Confirm the identity of the person showing property and don’t submit applications or any personal information until you do. Have questions about keeping your listings safe or other real estate topics? Make a comment below or drop me a line: Contact Us. Each week Real Living with Broker John™ provides innovative tips and information regarding all aspects of owning, buying and selling real estate. John Souerbry is Broker/Owner of Cordon Real Estate, a full service brokerage in California’s San Francisco Bay Area (CalDRE License 01370983). Contact John with questions or comments regarding Real Living or real estate in Wine Country/North Bay, East Bay and Silicon Valley. Real Living with Broker John™ is available for sharing in your online or print publication, for more information click here: Real Living With Broker John.